Back in the 1985 João Luiz Coutinho de Faria got an idea, an idea to make a Cachaca so good, that everybody will go wild after it. He bought 90 acres of land surrounded by mountains that lies on altitude of 2800 feet (850 meters) in the region of Rio de Janeiro state, where he started to grow sugarcane. On his estate he installed the mill, distillery and a warehouse for aging barrels and started to produce his Cachaça Magnifique in 1997. The production itself is done almost the same as centuries ago. The sugarcane is cut by hand, without any burning, and the extraction of broth is made on the same day. The distillation then is done in copper pots and the aging itself in oak barrels. 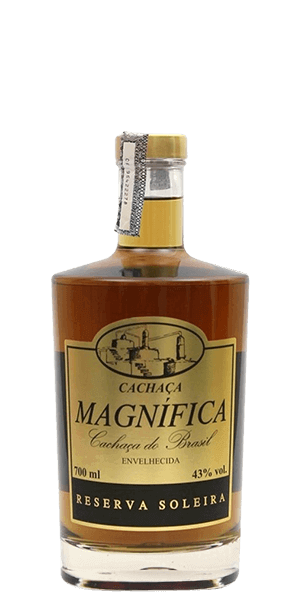 Magnifica Reserva Soleira is their most exclusive expression of Cachaca. It ages up to 10 years in toasted used Jack Daniel’s barrels to give it that final complexity and taste. And on top of that they also use the solera method for aging. Due to long time and limited availability, only a few thousand litres of this precious liquid is bottled per year. Quite a Cachaca for experts that must not slip by you. What does Magnifica Reserva Soleira taste like? The Flavor Spiral™ shows the most common flavors that you'll taste in Magnifica Reserva Soleira and gives you a chance to have a taste of it before actually tasting it. Fruity explosion! Banana and cherry plum in the first row and some Rooibos tea and a slight metallic tone in the back seats. Soft aromatic dominance of wood, some brandy and plum sensation. A long, aromatic and fulfilling finish that delivers oak mostly. Oak, passion fruit, toasted, banana, cherry, tea, coconut, mango, chestnut.